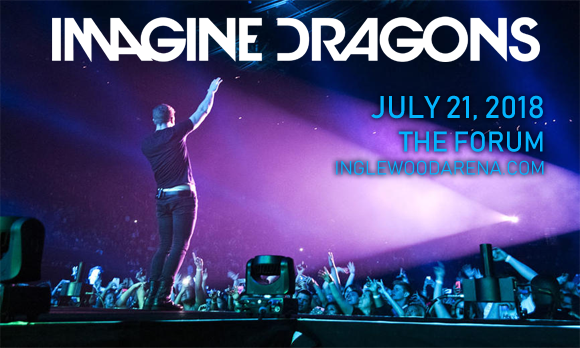 Imagine Dragons are coming to The Forum on Saturday 21st July 2018, bringing a night of thundering alt-rock to the stage as part of their 2018 Evolve Tour! Known for their chart-topping hits like "Radioactive" and their powerful, uplifting shows, the band are a must-see act live, so don't miss your chance! Tickets available now! American alternative rock band Imagine Dragons formed in Las Vegas, Nevada in 2008. Releasing their debut studio album Night Visions in 2012, the band soon became a mainstream hit with their single “Radioactive”, finding themselves on several “Best of 2013” lists and earning a total of fourteen different awards at the 2014 Billboard Music Awards, including Top Artist of the Year and a Milestone Award, which recognizes innovation and creativity of artists across different genres. The band's second album, Smoke + Mirrors (2015), reached number one in the US, Canada and the UK and their most recent album, Evolve, was released in 2017.